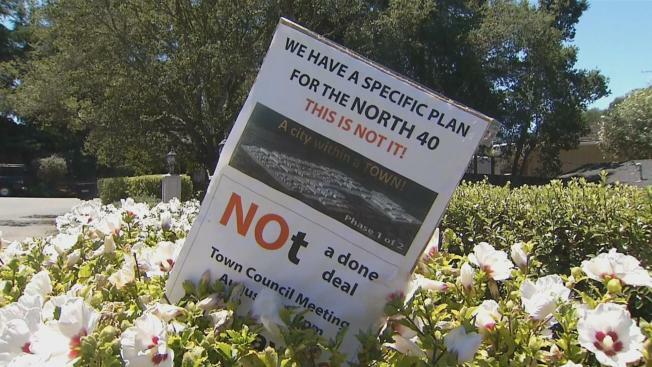 Hundreds of Los Gatos residents showed up at the Tuesday night Town Council meeting to speak out about the controversial North 40 project. Developers want to build hundreds of homes and commerical space on 44 acres between Highway 17 and Los Gatos Boulevard, just south of Highway 85, but many residents feel the project doesn't fit with the town's general plan. The proposal calls for tearing out an orchard and building 320 homes and 66,000 square feet of retail stores. "It doesn't follow the town's specific plan," said Cindy Schneider. "It's not the look and feel of Los Gatos." There are also concerns about traffic. "I think we are going to become gridlocked and become like Los Angeles," said Lainey Richardson, a Los Gatos native. Others worry the proposed big box stores will hurt small business owers downtown. "We can't afford to have 300-400 people a week shop elsewhere when these downtown businesses are already fighting so hard to hold on," said former Los Gatos Mayor Sandy Decker. But a few business owners near the North 40 support the development beacause it will likely increase foot traffic in the area. The developer for the project, Grosvenor Americas, did not immediately respond to requests for comment. In a letter sent to the town manager last month, attorneys for the developer said reducing the number of housing units would be inconsistent with the density bonus law and the Housing Accountability Act and threatened to sue if the town denies the planning application. The Town Council has scheduled a special meeting for Thursday for additional public comment.